Casual boating has become a very popular trend out on the Minnesota waters. While the adrenaline of a speed boat is appealing to some, some speed boat owners are trading their boats in for the laid back and smooth feel of a pontoon boat. Now that the spring weather in Minnetonka MN is here for good, it’s time to get your pontoon boat back on the water in Minnesota. If you are looking to buy a pontoon boat that needs some repairs, or if you have noticed some issues with your existing pontoon boat that needs to be addressed before you take it out on the water, our team at Anchor Marine Repair is here to help! Specializing in pontoon repairs, you can count on our staff to get your boat in the best shape it has been in for years. When you think of comfort and a relaxing atmosphere on the water, pontoon boats come to mind. While it is easy to sit back and forget about life stressors while strolling the waters of Minnesota, your boat can also become a stressor if it needs repairs. At Anchor Marine Repair, our team has worked on repairing countless pontoon boats during our 45 years of combined repair experience. Whether you need regular maintenance, upholstery upgrades, engine work, windshield repair, or propeller correction, we’ve got you covered. Pontoons are not invincible to damage on the water. Although you may be traveling at a slower pace, your pontoon can still come into contact with debris on the lake. 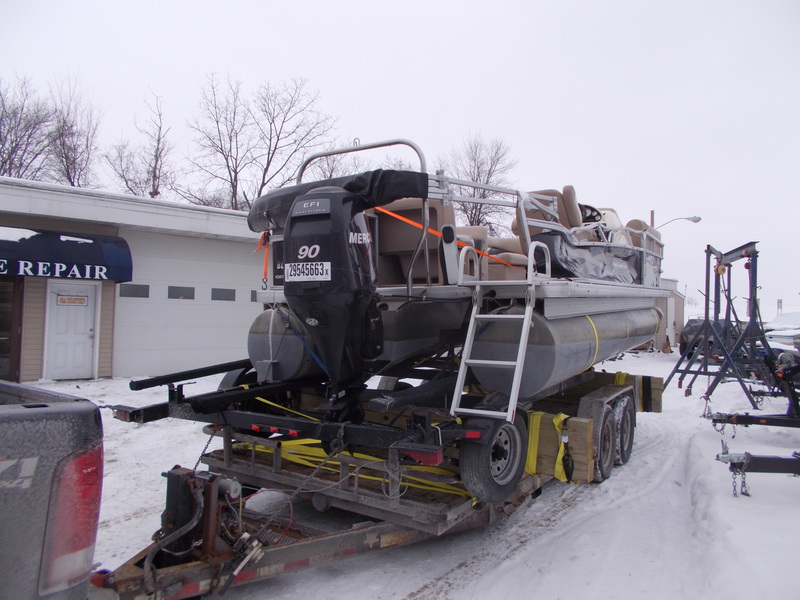 Have you been putting off your pontoon boat repair because you are having difficulty getting it transported? At Anchor Marine Repair, we take care of that issue for you thanks to our complimentary pickup and drop off services within 250 miles of the Minneapolis/St Paul area. All you have to do is pick up the phone and call our dedicated repair specialists, and we’ll handle the rest. Our goal is to get your pontoon into better than pre-accident condition, and to get you back out on the Minnesota waters quickly. So sit back and relax while our repair experts handle all of your pontoon boat repair needs. If you have a pontoon boat in Minnetonka, MN that needs to be repaired, our staff is happy to provide you with a free estimate. Give Anchor Marine Repair a call today at (763) 972-3540 or email service@anchormarinerepair.com and we’ll get your pontoon boat back out on the water this spring!